Patrick Quirke arrives at the Central Criminal Court Dublin yesterday. Quirke detailed financial involvements with Lowry amounting to tens of thousands of euro and spoke about the affair they carried on from January 2008 until early 2010. Quirke (50) of Breanshamore, Co Tipperary has pleaded not guilty to the murder of Bobby Ryan, a part-time DJ who went by the name Mr Moonlight. Ryan went missing on 3 June 2011 after leaving his girlfriend Mary Lowry’s home at about 6.30am. His body was found in an underground run-off tank on the farm at Fawnagown, Tipperary, owned by Lowry and leased by the accused, 22 months later in April 2013. The prosecution claims Quirke murdered Ryan so he could rekindle an affair with Lowry (52). Detective Garda David Buckley today told prosecution counsel Michael Bowman SC that he arrested Patrick Quirke on 20 January 2014 on suspicion of harassment of Lowry. Gardaí questioned him at Tipperary Garda Station. Quirke told Gardaí that Lowry gave him €80,000 to invest in Contracts for Difference (CFDs) and they agreed that they would split any profits equally. They made €40,000 each over a period of about 18 months, he said. Gardaí suggested to him that this was a “win-win” situation for him as he was investing someone else’s money. He said he managed the investment. Gardaí suggested this was “another example” of Quirke having control over a “vulnerable woman”. He further told Gardaí that he received a Single Farm Payment of €8,000 per year for the land he leased off Mary Lowry. He said this would be normal, and that those payments are not necessarily for the owner of the land but for the farmer. He paid €12,600 per year to Mary Lowry for rent of the land. Gardaí asked him about a provision in Lowry’s will for €100,000 to be left to Quirke. He said he discussed this with her, telling her that if something happened to her she would have to consider what would happen to her children. He said whoever was to look after them would need the money to buy a bigger car and to add an extension to their home. He denied that this was a benefit to him. At one point he needed to repay a bank loan and told Lowry that he would have to sell shares at a loss to make the payment. He said Lowry gave him €20,000 and told him she didn’t need it back until her children started going to college. Gardaí suggested to him that he had demanded this money. He replied that he didn’t demand it and said if was able to get €20,000 by demanding it he would have asked for €200,000. He denied that he was trying to “take Mary Lowry to the cleaners”. Gardaí put it to him that he pressured Mary Lowry into giving him a cheque for €50,000. He said that was a “downright lie” and challenged them to prove it. A cheque, he said, would leave a paper trail and they would find no evidence of a payment to him of €50,000 from Mary Lowry. 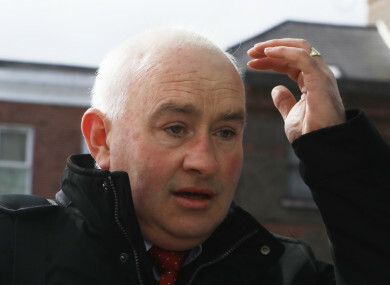 Gardaí then challenged Quirke on a claim that his cattle were infected with bovine venereal diarrhoea (BVD) by a cow from Lowry’s late husband’s herd. He said he told Lowry about this and she asked if she should compensate him. He told her she should and that Martin, her husband, would have. Email “'A downright lie': Patrick Quirke denies demanding money from Mary Lowry, court hears”. Feedback on “'A downright lie': Patrick Quirke denies demanding money from Mary Lowry, court hears”.